How to Choose a Wedding Photographer - Everything You Need To Know! 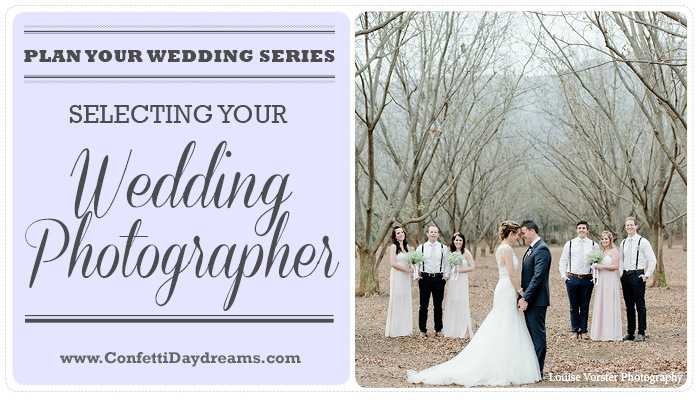 Learn How to Choose a Wedding Photographer for Your Big Day! Wondering how to choose a wedding photographer? Well, in this week’s How to Plan A Wedding Planning Series, we’re dishing out important tips on how to select one of the most important vendors of your wedding day. Yes, we’re talking about how to choose a wedding photographer! After breaking down your wedding budget, deciding if you need a wedding planner, securing your dream venue, and finding a great marriage officer, the next step in the wedding planning process is the absolute most important booking you will make for your wedding; choosing your wedding photographer. You will need the right photographer to capture every special moment and detail! Wedding planner expert, Nicci of Nicolette Weddings gives us some advice to help you make your choice. From the get-go, Nicci explains that if there is one item that you will book for your wedding that you absolutely shouldn’t skimp or “go cheap” on, it’s your photographer. Your wedding photographer could cost anywhere from 10% – 18% of your total wedding budget. Why? Well not only do you want the best possible person to capture the special moments of your once-in-a-lifetime day, but you also want an expert who has years of experience and knowledge of how to get the best out of both you as a couple and your décor on your big day. After all the money has been spent, the food eaten and the music played their is only thing you other than your awesome relationship that you will have to show for it the afterwards – your photographs. Here we’ll help you figure out how to choose a wedding photographer – ideally one whose work you will love. Review the wedding photographer’s blog to 5+ see full weddings they’ve shot. Instagram isn’t enough. You’ll need to be certain that you love their style, and that they are consistent in their work from start to finish for each couple that they have photographed. This is such an important tip when learning how to choose a wedding photographer. Ask for contact details of previous clients for references, so that you can check the wedding photographer is experienced, reliable and great to work with. Meet with the your potential photographer first to make sure that you vibe together. You’re going to be spending a huge amount of time with them on your wedding day, so you want some that you feel super comfortable and relaxed with. Being chilled and having a good time will also make all the difference in your wedding photographs. Try to make time to meet them before your big day to get to know them a little better. An engagement shoot is great for this. Have an engagement shoot before your wedding to get comfortable with the idea of being in front of the camera, and to become more familiar with working with your photographer. This way, you and your other half can learn what it’s like to be photographed together by your chosen photographer, before your big day. You can see it as a test run. Many couple’s use the pictures from their engagement shoot for their save-the-dates, invitations, or wedding websites too. Do not expect your chosen wedding photographer to be in two places at once. It is almost impossible for your photographer to present during your couple shoot, and capture your cocktail and canapé hour at the same time, for example. TIP: Remember that a photographer’s assistant is NOT the same as a second shooter. An assistant needs to be with the photographer at all times to assist with shooting and help with lighting, while a second shooter can also photograph one part of your wedding, while your main photographer is shooting another part. Include a delivery timeline in your contract. Many couples are surprised to learn that they will not receive their pictures immediately after their big day. Generally you can expect to wait at least 4-6 weeks, depending on how busy your photographer is during that time of year. Discuss this with your photographer and agree in writing. Read these 30 Wedding Photography Tips for Amazing Wedding Photographs! Explain to your photographer what you want. Your photographer will then tell you what is possible and what isn’t. Ask your wedding photographer can offer advice with the planning of your day, time lines, and best shoot locations. Your photographer should be able to make the most of whatever time limits you have, but make sure they are aware of your wedding day timeline. Put together a wedding day timeline and stick to it. Your photographer can advise on how best to set out a time line for the day, just be sure your photographer is aware of the running order. Then be on time with the completion of your hair, make-up or grooming so that there is enough time to do your bridal portrait shots as this is something photographers don’t like to rush. Don’t expect sunset couple photos, if your timing for the day runs late. There are many things that photographers can control, however the weather and sunset are two things that they can’t. Tell your photographer who important family members are that you want shots of or if anything is particularly sentimental. The more information you can give your photographer the better. Ensure that all suppliers have been given the same timeline. Your photographer will be taking photos of most aspects of the wedding if they know they correct time and place to shoot it. Embrace and trust in the process of the day. In most cases, this will be your first wedding, and just one of many for the suppliers involved. Ask for your photographer’s input. What Does a Wedding Planner Do? Do I Need One? 30+ Important Wedding Costs You Might Have Overlooked! Learn more about How to Plan Your Wedding Here! Great insight…I did giggle a bit about not expecting them to be at 2 places at once. Lol…couples should consider hiring a second shooter if they think it’s necessary. Such great advice on getting a second shooter Gee!